We’ve got a pair of tickets for each of the Dead Prez and company gigs up for grabs. Just answer the stupidly easy question to be in with a chance of seeing the duo, Black Twang and more. Supported by Love Music Hate Racism, the Bigger Than Hiphop tour touches down in the UK next month. The line up is huge, featuring headliners Dead Prez, alongside a wealth of UK talent including Black Twang, Rodney P, Skitz, MC D and many more. A third of the proceeds go towards charities including Afrikids and Justice For Columbia. Afrikids is a grass roots NGO working with communities in one of the world’s poorest regions, to help make life better and safer for their children. Justice For Columbia works towards providing innocent people in Columbia with urgently needed solidarity and assistance in the struggle for human rights, decent wage, working and living conditions and life itself. Representatives will be present on the night distributing their messages to the masses. 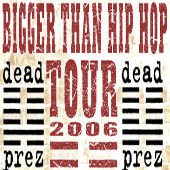 What are the names of the two rappers in Dead Prez? Rapnews have been given a pair of tickets for each of the UK dates to give away to a winner chosen at random, who e-mail’s in the correct answer to the question above. You may enter as many times as you wish, no later than the 20th of April. Make sure you give your address and what tour date you’d prefer attending.